How to conquer closet boredom. I’m always attracted to books and blogs about wardrobe organization, closet challenges, and ways to “do more with less”. First, because I am analytical by nature. Also: if I allowed myself to buy every appealing piece of clothing I came upon, I’d be both broke and covered in clutter. So the 10 x 10 Style Challenge (ten pieces for ten days, mixed and matched) sounded intriguing. It’s everywhere on the ‘net, but the blogger Style Bee has made it a specialty and a mission: to “to get more creative with [my] clothes”. I used her general guidelines to power through closet boredom. I had to break a few rules, I had to! 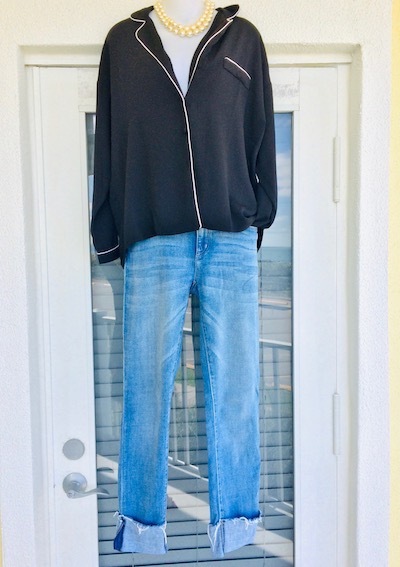 So I didn’t count outerwear among my ten pieces because, heh, it’s Florida and usually a denim jacket will do. But adding in coats and jackets will create a whole lot more looks. I didn’t count hairpieces either, although they can change up a look in an instant. My challenge pieces included: Four tops, four bottoms, my navy booties and my oxford/sneakers. I’ve actually since donated one of the bottoms, a corduroy skirt, because in a picture it looked dowdy on me (the horror!). An unexpected benefit of the challenge is to look at yourself with fresh eyes. This is the only pic with the actual me in it, as I forgot to take pics every day, #lazyandforgetful. 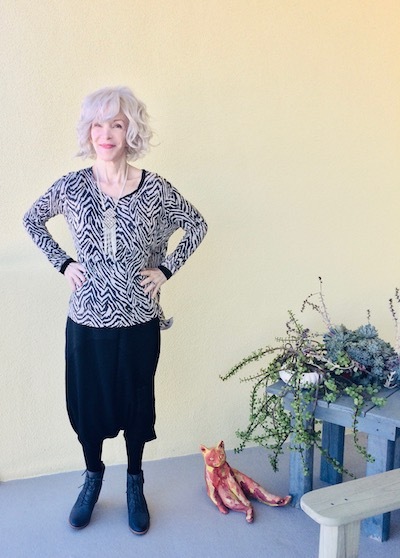 My black drop-crotch trousers turned out to be a favorite. A floral print blouse dresses up the casual skirt. I added a thrifted tassel necklace, and a silk scarf (gift from Suzanne) for a belt. It looks a little lumpy here, but wearing the blouse backwards also works, with a funky pendant. You can see my elbow, and the ocean in the reflection. My new pajama-style shirt was a hit. It’s tucked into my cuffed jeans, here, with a fake pearl choker up top. 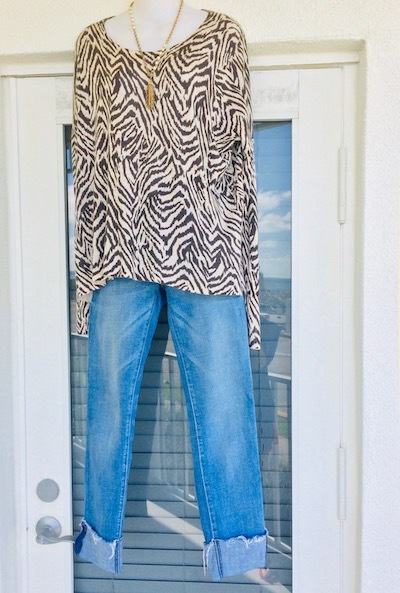 And the animal print sweater looks good flowing over the jeans (it also could be tucked and belted). There’s no way ten pieces would ever be enough to keep me interested! This was just for fun. But with 20-30 more pieces, I will have conquered wardrobe boredom. 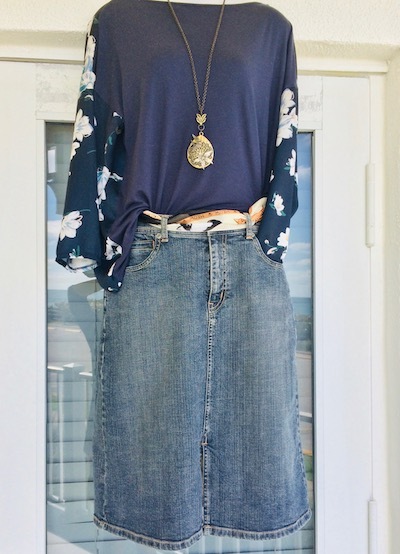 I need to upgrade the things I wear the most, like this denim skirt: I’m looking for a slimmer, darker one, and maybe an inch longer. It’s fun to wear things in contradiction to manufacturer’s instructions, like a backwards sweater. Try it with a cardigan for an unexpected look. Necklaces, scarves, bracelets, tights: they make a huge difference. Pile on the scarves, wear one as a headwrap, stack your rings or wear just one thin bangle. It’s all there in the closet! Do you enjoy a wardrobe challenge? Please let us know about it in the comments. Looking for the details on your pajama style shirt. Yeah, there’s no way 10 pieces would keep me interested for any length of time. It’s an interesting experiment to try though. I tend to wear groups of clothes at a time weirdly anyways–like I sort of do this naturally, and with jewelry sets, too. I need to get a little more back into shape (holiday weight!!) because I’m missing wearing my jeans—these outfits make me miss denim. And I’ll say it again—I love that pajama shirt! I read this and initially thought me , never but then realised this pretty much what I did when travelling recently. The value of accessories comes to the fore as you have shown.Not sure if I could do it at home but I do repeat pieces . Yes, traveling is a great application for this challenge! And I agree, I couldn’t go more than ten days either, xox. Ten pieces wouldn’t do me wither, Ann, at least not after the ten days! Yes, show us your back-to-front sweater on the blog, xox. Only 10 items is an extreme edit which may have made my head explode but as Taste of France wrote, “Creativity without consumption is great.” It certainly would make me think. You did a great job while still maintaining your personal style statement. I keep wondering what a capsule wardrobe would look like based on bold colours and patterns. Maybe I need to try to create one. Wow! Inspiring as always, Patti. I have authority issues so when I see or hear the word “challenge,” my hackles rise. In this case, since no one was around or actually threatening my rebellious spirit, I decided to get into the spirit of the post. 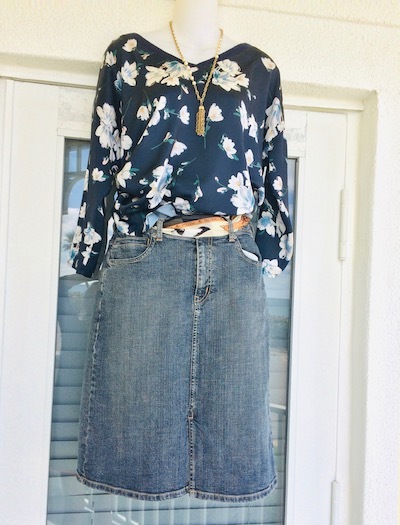 Of course, I immediately wanted a denim skirt like yours. With my mannequin, I am going to start playing this weekend and see how creative I can be. My own personal goal is to use more of my accessories. Your pearls with the p.j. top were brilliant. I love your looks. I don’t get bored with clothes. I see pretty things and would like them, but I stop myself. I do try to wear things in different ways. Change is good. Creativity without consumption is great.